Subsequent to the 1992 ‘people power’ that overthrew the long rule of military government, Thailand has gone through a political rollercoaster. The growing democratic space enabled new political actors to emerge, while a liberalized economy empowered the country’s rural poor to move up the social ladder. The traditional ruling class have regarded these nascent forces as a threat to their status quo and privilege. The struggle between the two color-coded camps – Red and Yellow Shirts – was set in motion since 2005, culminating in the latest coup in 2014. In this talk, I will demonstrate an episode of civil resistance that aims to de-legitimize the incumbent military junta. Janjira 1Groups of students, activists and ordinary citizens have courageously staged symbolic protests and organized public meetings, despite the imposed draconian laws and continuous crackdown. I argue that these attempts have born some degree of successes in challenging the junta’s authority. However, they face critical challenges caused by the junta’s learning curb and existing social division. 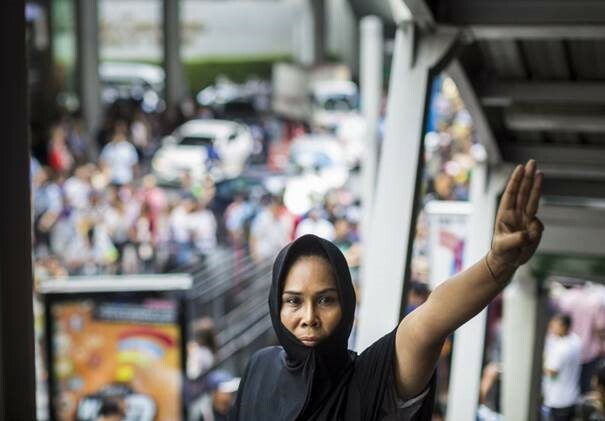 The Thai case serves as a reminder to rethink a strategy of civil resistance that can effectively challenge military dictatorship in the 21st century. Janji ra Sombatpoonsiri is an assistant professor at the Faculty of Political Science, Thammasat University in Bangkok. She is the author of the Ph.D. thesis-turned book Humor and Nonviolent Struggle in Serbia (New York: Syracuse University Press, 2015). Her latest journal articles and book chapters include “Playful subversion: Red Sunday’s Nonviolent Activism in Thailand’s Post-2010 Crackdown,” Journal of Peace & Policy Vol. 20 (2015); “Nonviolent action as the interplay between political contexts and ‘insider’s knowledge’: exploring Otpor’s preference for humorous protest across Serbian towns,” in Civil Resistance: Process and Practice, ed. Kurt Schock (Minnesota: University of Minnesota Press, 2015), 59-92; and “Securitization of civil resistance: the Thai junta and beyond,” Journal of Resistance Studies, vol. 1, no. 2 (2015): 85-126. In addition, she has written op-ed articles for a Thai newspaper, focusing the politics of nonviolent struggle. She currently serves as the co-Secretary General of Asia-Pacific Peace Research Association (APPRA). Erickson Nepstad, S. (2015) ‘How Regimes Counter Civil Resistance Movements,’ in K. Schock (ed. ), Civil Resistance: Comparative Perspective on Nonviolent Struggle. Minnesota: University of Minnesota Press, pp. 121-44. Janjira S. (2015) ‘Playful Subversion: Red Sunday’s Nonviolent Activism in Thailand’s Post-2010 Crackdown,’ Journal of Peace & Policy 20: 93-107. Janjira, S. (2015) ‘Securitisation of civil resistance: Thailand’s military junta and beyond,’ Journal of Resistance Studies 2(1): 85-126. Kasian T. (2016) ‘The Irony of Democratization and the Decline of Royal Hegemony in Thailand,’ Southeast Asian Studies 2(2): 217-37. Kurtz, L. and L. Smithy (eds.) (forthcoming) The Paradox of Repression. McCargo, D. (2005) ‘Network monarchy and legitimacy crises in Thailand,’ The Pacific Review 18 (December), pp. 499-519. Reynolds, C.J., ed. (2004) National Identity and its Defender: Thailand Today. Chaing Mai: Silkworm Books. Saxer, M. (2014) In the Vertigo of Change: How to Resolve Thailand’s Transformation Crisis. Bangkok: OpenWorlds.